Hola. It’s been awhile but I hope you’re still finding these videos helpful. 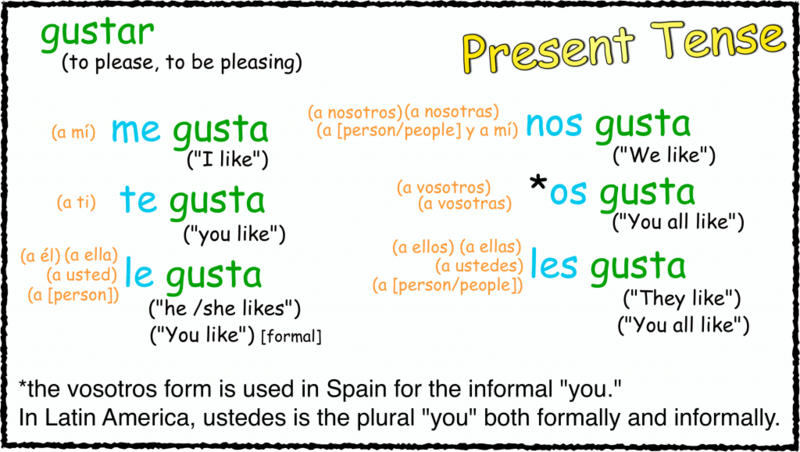 So far we’ve learned how to say “I like” (me gusta) and “You like” (te gusta) in Spanish. But now it’s time to learn how to talk about other people’s likes and dislikes. Enjoy! Feel free to add any questions or comments. 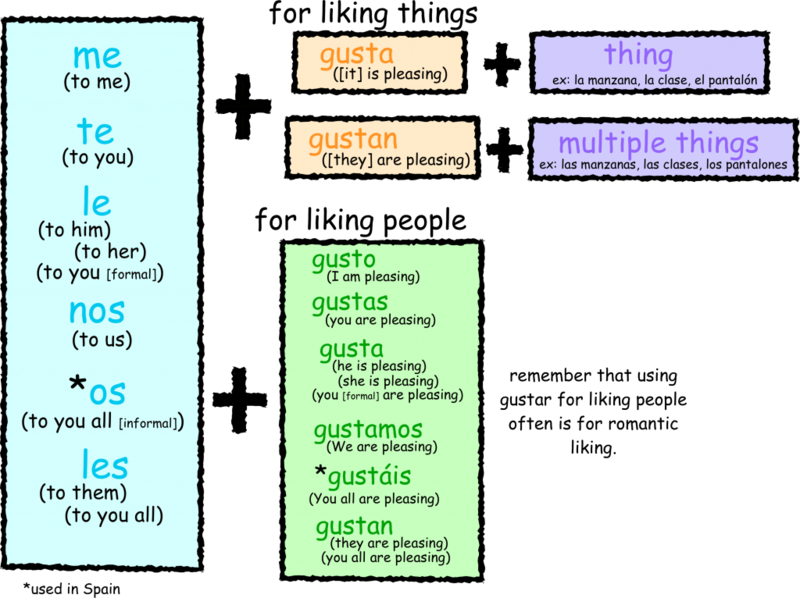 Or practice your own sentences with gustar. Yes, sir it’s been awhile, we really miss your tutorials they are very helpful. Its good to hear from you again. thanks for the new video. by the way, when I convert your videos to mp3 I don’t very good quality voice I think if you use a separate device to record the voice then add it to the video you will have a better voice in the videos. Hola! Yo estoy nueve estudiante a ti. Puedes Hacer un video por Los possessivo pronombre, por favor? I have tried hard to frame my request in espanol. Hope it is verdad. Thanks for the new videos! I really appreciate your great work. I am using your videos (this and the “jugar” in the present tense) yet again to support my students! I have multiple SPED students who find your calm voice and clear explanations with simple graphics to be an immense boost. All students can play and replay your videos. (Your current survey about tee shirts… I would have loved your “cinco de mayo” shirt.) Thank you for all you do. If you and your family are ever in Newport News, Virginia, please feel free to visit Denbigh High School. I’d be happy to share my resources with you. If you use a “Smartboard” you are welcome to anything I’ve created. It turns out the “Cinco de Mayo” shirt wasn’t actually my design. I’ll possibly be working on more designs in the future though! My kids and I could simply NOT wrap our minds around how this word worked from the curriculum we are using and your video cleared it all up for us. ¡Muchas gracias!